Alejandro Junger, M.D., graduated from medical school in Uruguay and moved to New York for his postgraduate training. The dramatic change in his lifestyle and diet led to him developing irritable bowel syndrome and depression. He began a search to find the solution to his health problems and discovered the benefits of cleansing and detoxification diets. In Clean Gut he reveals how our general body health is connected to one important area of our body – the gut. This book is a manual to help you cleanse and heal your gut to recover from chronic illness and maintain optimal health. It is a more expanded and complete program compared with his earlier book, Clean. Dr. Junger explains how the root cause of almost all chronic disease begins in your gut. He says that most diseases – including heart disease, cancer, asthma, diabetes, insomnia, depression, and arthritis – can be traced back to your gut. Simply eating a healthy diet isn’t enough to overcome these problems. However they can all be reversed by following his specially designed gut repair program. You will drink a liquid breakfast. Lunch and dinner is chosen from recipes provided in the book. The diet focuses on foods that are low in sugar and easy to digest. At the same time you will take a variety of nutritional supplements to heal your gut. You will slowly reintroduce foods back into your diet over one week. This helps you identify foods that don’t support your long-term gut health. You also create your own dietary blueprint to suit your needs and lifestyle. Free-range organic poultry, grass-fed beef, lamb, wild-caught fish, organic eggs, non-dairy milk, rice protein powder, raw cashews, almond butter, hemp seeds, coconut flakes, berries, avocado, spinach, kale, zucchini, mushrooms, butternut squash, coconut oil, olive oil, herbs and spices, stevia. Exercise is recommended because it helps you burn fat and creates endorphins which improves your mood. Whatever type of exercise you choose, it should be regarded as an integral part of living clean for life. 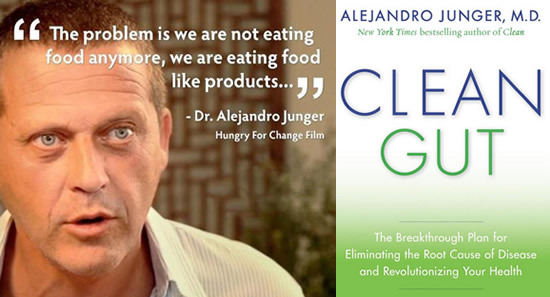 Clean Gut: The Breakthrough Plan for Eliminating the Root Cause of Disease and Revolutionizing Your Health retails at $27.99. Offers a gentle way to cleanse and detox the body. May provide relief from chronic health issues that have not responded to standard treatments. Encourages consumption of fresh, unprocessed and organic foods. Dieters can expect to lose weight due to a reduced intake of calories. Necessary to prepare all meals at home for the duration of the program. Requires the use of multiple nutritional supplements, which may be expensive. Some individuals may require a longer duration on the program to achieve their desired results. Clean Gut is a 28-day program designed to heal your gut and eliminate chronic and stubborn health problems. The plan focuses on foods that are light and easy to digest. This is combined with nutritional supplements to support the function of the digestive system. By improving digestion, your entire body will benefit, providing a foundation for optimal health over the long-term. Good day to sir. I’m suffering with acid reflux issues for years, mood swings, anxiety, depression, joint pain. I don’t know what else to do can you please help me.